Bakutel 2018, the 24th Azerbaijan International Telecommunications, Innovations and High Technologies Exhibition and Conference will be held in Baku from the 4th to the 7th of December. The exhibition will mark the beginning of High Technologies Week. Today, Bakutel is much more than an exposition of ICT achievements; it is a business exhibition, networking platform, inspirational conferences, promising start-ups and a high-tech game zone. This is a meeting place for those involved in shaping the digital future. Over the course of four days, the exhibition will showcase the following thematic sections: digitalization solutions, Big Data, M2M, Internet of Things, banking technologies, 4-5G mobile technologies, services in the field of fibre-optics and cloud technologies, the latest ways to suppress cyber-crime, government services, e-health, artificial intelligence, mobile devices and accessories, Smart City, unmanned air vehicle control systems and drones, and much more. The visit of the President of the Republic of Azerbaijan Mr. Ilham Aliyev to the exhibition testifies to the care and attention of the country's leadership for this field, and the authority of Bakutel. The exhibition has the support of the Ministry of Transport, Communications and High Technologies of the Republic of Azerbaijan, ITU - International Telecommunication Union, Regional Commonwealth in the field of Communications (RCC), Azerbaijan Fund for the Promotion of Export and Investment (AZPROMO), the National Confederation of the Entrepreneurs (Employers) Organizations of Azerbaijan Republic (AEC), and Small and Medium Business Development Agency of the Republic of Azerbaijan. The organiser of the exhibition is Caspian Event Organisers (CEO). The general sponsor of the exhibition is Azercell Telecom, which has been a participant of the exhibition for 20 years. Traditionally the exhibition is visited by foreign experts and heads of industry organisations. This year the honored guests of the Bakutel are the ministers and representatives from Russia, Turkey, Belarus, Afghanistan, Kazakhstan, Kyrgyzstan, Turkmenistan, Iran, Uzbekistan, Latvia, and Bulgaria. The Bakutel 2018 exhibition has gathered 200 companies from 20 countries around the world on one site, which means a 25% increase of occupied exhibition space. Leading ICT companies, mobile operators, Internet providers, system integrators, distributors of well-known brands and young developers represent the real solutions and technologies necessary for success. Enterprises dealing with electronic commerce (e-commerce) are located in the second hall at a separate stand. Debutants of this year make up 30% of the total number of exhibitors. The list of participants is replenished annually thanks to new companies on-board; so, among this year’s debutants are Silk Way Business Aviation, the State Advertising Agency of Azerbaijan (ADRA), Systematics (Russia), Suntech (Poland), Hostimul (Azerbaijan), IPG IRE-Polus (Russia), Xerrow Technologies (ОАЭ) and many more. This year, 10 countries - Belarus, Croatia, France, Turkey, Iran, Italy, Slovenia, UAE, USA and Poland will present at their stands leading companies from their respective countries and innovative projects not only for Azerbaijan, but for the entire Caspian region, in addition to presenting various products and ICT services. 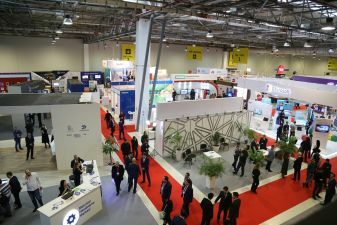 Leading Azerbaijani state ICT structures are represented on a single national stand, organised by the Ministry of Transport, Communications and High Technologies of the Republic of Azerbaijan. New developmental projects in the fields of communication, high technologies, mail projects, a nanotechnology, E-government, the infrastructure of "electronic signature", and cloud services Data Center and some startup are presented at the stand. The exhibition will reflect many international and local projects in the field of ICT, in which Azerbaijan is directly involved. During the exhibition, a museum dedicated to the 200th Anniversary of postal communications in Azerbaijan will be open in the lobby. Here are demonstrated exhibits, letters, telegrams, communication devices, commutator phones, Morse code alphabet, official documents for the period, postal and communication workers' clothing, letters, small packages and wrappers. At the same time, postcards from World War II, military letters, mailboxes, and postcards coinciding with the 70s and 80s of the last century will presented. A special area dedicated to the development of postal service during National Leader Heydar Aliyev’s presidency will be presented at the exhibition. The prize lottery is also devoted to this remarkable event for all visitors to the exhibition, which will be played at the AzerPocht stand. The new direction of the exhibition will be the involvement of small and medium-sized businesses and private technology developers to solve problems in various fields - from oil to entertainment - to help them promote their business. This direction is being developed with the support of the Agency for Development of Small and Medium Entrepreneurship of the Republic of Azerbaijan. Ten companies AG Development, emobile.az, Frazex, Hesab.az, İDEA Consulting, iticket, Morooq, Remart Group, SMART IT и Ticketsetup will be represented at the joint stand. For example, among this year’s debutants is the Azerbaijan State Advertising Agency (ADRA), will showcase a new outdoor advertising tracking system. The company Eurodesign will present the technology of tele-presence used for prisoners and detainees, as well as special bracelets for those under house arrest. The exhibition continues the tradition of providing opportunities for young developers to discuss their inventions and projects, along with industry leaders and government agencies. It is gratifying that this year the exhibition features a record number of start-ups - over 50 from various innovation centres. Thus, start-ups of the High-Tech Park, finalists of the recently-launched start-up tour “From Idea to Business” in Azerbaijan, which include start-ups from Baku and other regions, innovation and entrepreneurship centres Barama (Azercell Telecom) and AppLab (Bakcell), will all take part in the exhibition. Start-ups present their bright innovative ideas for such sectors as tourism, ecology, HoReCa, healthcare, and accounting. An impressive part of developments is based on the application of virtual and augmented reality technologies, the development of websites and mobile applications. Many start-up products are ready for functional use, and there are those that exist so far as ideas requiring additional investment for development. This year, the business programme of the exhibition will be updated and become even more intense. Professional business events will begin on the 3rd of December. The programme will be opened by the 54th Meeting of the Council of Heads of Administrations of the Regional Commonwealth in the field of Communications (3 December, Hilton Hotel). Then the Meeting of the ICT Ministers of the Organisation of the Black Sea Economic Cooperation (BSEC) will take place (4 December, Boulevard Hotel Baku). The 4th Belarus-Azerbaijan ICT Forum is scheduled for December 5. The First Caspian Innovation Conference on the subject “Digital Interaction for Sustainable Development” will take over the gavel on the 5th of December. The initiator of the Caspian Innovation Conference is the Ministry of Transport, Communications and High Technologies of the Republic of Azerbaijan. The event will cover such topics as “Broadband Communication,” “Artificial Intelligence,” “Internet of Things,” “Electronic Services,” “ICT-Oriented Start-ups and Innovative Entrepreneurship,” “Fourth Industrial Revolution,” “High-Tech Production,” and "Cyber ​​training." The first Caspian Innovation Conference will bring together representatives of government, industry leaders, officials of regulatory structures and international organisations, including the heads of the largest regional telecommunications and satellite operators. The conference will play the role of regional platform for discussing opportunities for effective cooperation between all participants in the ICT sector, and will also contribute to solving problems in this field. In the future, this conference is projected to be held annually at the international Bakutel exhibition. Starting last year, B2B meetings are held as part of the exhibition; this year’s meetings will be held on December 4 on an even larger scale by attracting representatives of companies from vertical markets to whom exhibitors can offer their digital solutions. Special attention is paid to women and their role in ICT. Bakutel, together with the Azerbaijan Women’s ICT Club (Femmes Digitales), will hold an AWITA 2018 – Azerbaijan - the Women in IT Award awards ceremony on the second day of the event to recognise the most successful women working in the field of information and communication technologies in Azerbaijan. The Evening reception sponsor is Pasha Bank, and the floristic partner is Lilac Flower Boutique. This year's Bakutel exhibition supports children with psychological developmental issues. As part of Bakutel 2018, a charity auction of clip art done during start-up tours in eight regions of the country will be held within the framework of the project “From Idea to Business.” Funds raised at the auction will go to supporting children on the autism spectrums that are undergoing rehabilitation in the public association “Together and Healthy.” Note that the paintings are the work of the famous graphic designer Mahir Gafarov. It should also be noted that on December 6-7 the ministry will organise an excursion for pupils of orphanages in Baku to visit the Bakutel exhibition. They will be able to get acquainted with the functioning pavilions of the exhibition and have fun in the zone of innovative games. In addition to annual meetings and conferences, the exhibition has announced Bakutel Tech Talks, a new dynamic discussion platform created by exhibition organisers. For two days, December 5 and 6, Bakutel Tech Talks will draw the attention of audiences with a stream of useful information and unusual content. December 5 Tech Talks will be opened by ITV's famous TV presenter Vusala Said, who will kick off the Bizimkiler session. The name of the session comes from the fact that our compatriots working abroad in world-renowned IT companies will be the speakers. The purpose of the session is to convey to the audience the experiences of large international IT-companies, and to acquaint them with the latest industry know-how. Will make reports Zaur Fataliyev, Senior Engineer, LG Electronics, Korea - “Deep Learning for Computer Vision”, Elchin Asgarli, Software Engineer, Google, USA – “Modern Full Stack Software Engineering”, Maral Gurbanzade, Researcher at Leiden Institute of Advanced Computer Science, Netherlands – “Social Robots and Design Trends in Social Robotics, as well as Probable Consequences of their Introduction into the Global Market”, Taghi Aliyev, Full time Doctoral Student at CERN, Switzerland – “Artificial Intelligence (AI) in Healthcare and Science: Known and Unknown Facts; Limits and Potential Reach of Artificial Intelligence” and Rustam Hashimov – Senior Software Engineer, Facebook, USA - “Personalized Recommender Systems in Online Platforms: A Case Study of Modern Era Software Development and its Implications”, who will complete this session. December 6, Bakutel Tech Talks will continue with panel discussions under the slogan "IT-emize your perspective." The main idea is that IT technologies and solutions are in great demand in certain industries (TV & Radio broadcasting, transport, education, tourism). Panellists will discuss the specific digital solutions that are in demand. The purpose of the event is to establish a dialogue between consumers and suppliers of digital innovations, and the first topic will touch vectors of development of television technologies. The session will be moderated by Tural Yusifov - Author of “AvtoStop” Project and Ismail Aliyev - Advisor to Director General, İctimai Television, Fikret Azimov – Deputy Technical Director, Azad Azerbaijan TV and Ali Aliyev, - Head of New Projects Development Department, KATV1 will join the discussion. Further discussions will include the panel "IT Technologies in Transport" with the participation of the following speakers: Ramin Bayramov – Head of Information Analysis and Information Technologies Depatment, State Road Transport Service, Samir Karimov – Executive Director, 189 Taxi Service and moderator will be Tural Yusifov - Author of “AvtoStop” Project. The moderator of the next panel "IT Technologies in Education" is Jahid Ismayiloglu, PhD in Philology, researcher, Institute of Linguistics named after Nasimi, Azerbaijan National Academy of Sciences. The main speakers here will be Vusal Khanlarov – Head of the Bureau on ICT for Education, Ministry of Education of the Republic of Azerbaijan and Tatyana Mikayilova – Co-Founder, Edutainment.az, Anar Mammadov – Deputy Director, MEC International School. The panel will end with the discussion on "IT Technologies in Tourism," in which Nigar Arpadarai – Head of marketing and communications, F1 Azerbaijan GP will be the moderator and the speakers will be Ildirim Gambarov – Deputy CEO, Pasha Travel, Mahammad Muradov – Head of Tourism Policy Department, Azerbaijan Tourism Board, Rufat Baghirov – Director, Baku Tourism Information Center. The Bakutel Tech Talks programme on December 6 will continue with the session “From Start-up to Business,” to which start-ups and business youth are invited. In this session, experienced speakers will convey to the audience their confidence that all ideas can be implemented. The first outstanding presentation will be a report by Tal Catran, a business guru from Israel - a well-known expert in the field of building businesses and start-ups, a major investor, entrepreneur, founder and leader of several business accelerators and international innovation centres in Israel, and a member of the advisory board and chairman of several start-ups. He has extensive experience in managing large Hi-Tech companies and start-ups at the seed stage in a wide variety of technologies. Interesting speakers in this session will be Javid Mammadov - Director, Sumaks Technologies LLC, Farid Pardashunas – Founder, Technote Media & Hotbots Robotics, Magrur Rzayev – Software Developer, PictoFy. The main idea of ​​all the reports is to explain how a start-up system works and how to build start-ups correctly - from idea to running the business. This session will be a godsend for those who want to know how to find, test and implement their ideas, why it is important to share an idea and how to prevent it from being stolen. In the end, everyone will be able to ask questions about organising, financing and other issues of concern to all young developers. Tech Talks will address the most pressing issues of the industry and will become a sought-after platform for discussions with opinion leaders. The organisers plan to hold Bakutel Tech Talks annually at the exhibition. In addition to demonstrating and discussing technologies that form the digital environment, Bakutel is also a unique platform where entertainment utilising high-end technologies is presented. This year, the game zone will be located in the lobby and present the Digital Museum, robot tournament for First Lego League schoolchildren, the computer game “Yukseklik”, virtual fairy tales about national heroes – “Kulek - the first national heroes,” a digital museum project from 3D Productions, 3D printers that will print out landmarks of Azerbaijan, and a drones show. Exhibits from the Hedef Lyceum Museum of Interactive Science will also be presented. For the first time, the fastest goalkeeper in the world, Robokeeper, will be demonstrated at Bakutel 2018. Robokeeper is an innovative invention of German scientists and has already stolen a way into hearts of all football fans around the world. No matter how hard and fast you hit the ball – this smart goalkeeper will almost certainly save it. At the exhibition, visitors and guests of the exhibition will have the opportunity to test Robokeeper for its goal-saving ability; anyone who can score a goal will receive valuable prizes. Well-known football players from Azerbaijani clubs invited to the opening of Bakutel 2018, as well as Gurban Gurbanov, head coach of the Azerbaijani national team and the “Karabakh” club, who will also try to score a goal against the fastest goalkeeper. In the lobby of the Baku Expo Center there is children's area, which is organized by the partner of the exhibitions, the network of kindergartens Bagcam.az. Professional educators and teachers from Bagcam.az will take care of children with educational games, useful and exciting activities. In 2018, CEO’s official partners include Premier Tour, Hyatt Regency and Caucas Point Hotel. On 4 - 7 December, the exhibition will be open to industry specialists and persons working in related fields. Students will be able to visit the exhibition on 6 and 7 December only. Persons under 17 years of age accompanied by parents will be able to visit the exhibition on 7 December only. Thus, the ICT industry of the country lives in anticipation and preparation for its main event - the international exhibition Bakutel, which will demonstrate innovations and digital technologies provide entertainment, and prospects for new contacts, demonstrate digital solutions for everyday life. The exhibition is timed to coincide with the release of the official newspaper, “Bakutel Exhibition News 2018”, which will tell about the participants and events of the exhibition. This year the “Baku Convention Center” is sponsoring the “Bakutel Exhibition News”. The latest news from the Caspian ICT Weeks will be promptly posted on the exhibition websites and on the official pages on social networks. This year, the third day of the exhibition, 6 December, coincides with the celebration of professional day of workers in the field of communications and information technology in Azerbaijan. Taking this opportunity, the organisers congratulate communication and information technology workers on this wonderful holiday and wish them every success.